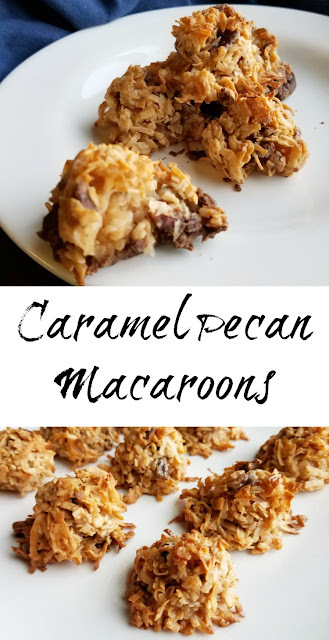 All it takes is three ingredients to make these fun caramel pecan macaroons. 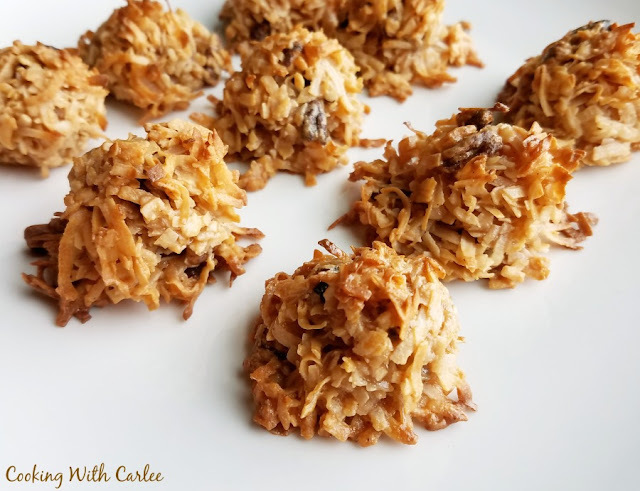 They are a bit caramelly candy and part coconut cookie. They are so fun! Apparently dulce de leche and I are having a bit of a thing right now. Can you blame us? After making cajeta I just had to make some dulce de leche too. It is strangely satisfying to watch the milk concentrate and carmelize right before your eyes. Then I had to make multiple batches to see how big of a difference the amount of baking soda makes. Spoiler alert: it makes quite the difference in the final color and less of a difference in the taste. So needless to say I had a lot to use. While eating it cold from the fridge on a spoon was a perfectly viable option in my eyes, I couldn't wait to try more fun recipes with it! So my brain got to clicking, which is always a little bit scary! If a lot of people make dulce de leche from cans of sweetened condensed milk and sweetened condensed milk makes yummy macaroons... why couldn't dulce de leche?! And if you are going to make caramelly macaroons, why not add pecans? I mean really, why not? 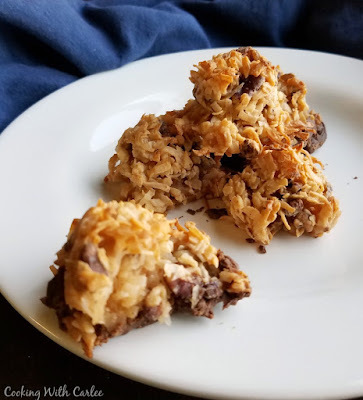 I envisioned it as a bit praline and a bit macaroon, or maybe like a german chocolate cake without the cake! It takes longer to gather the whole three ingredients than it does to stir these up. Then just use a small cookie scoop or a couple of teaspoons to transfer small amounts of batter to a sprayed cookies sheet. Bake them until they are golden and set. Easy peasy! Of course I couldn't help but add some chocolate to some of them. Just dunk the bottoms or drizzle a bit of melted chocolate on to take them to the next level! Stir together coconut, caramel and pecans. Cool completely and then remove from baking sheet. It may be dangerous for some of us to know how quickly we can have such a tasty sweet in our hands. Who knew this was so easy? They are amazingly easy, aren't they? Yes. They look so fancy. I thought you went to a lot of trouble to make those. I really was surprised to find out how easy they are. Whaaaaat, I know how tasty those mounds of goodness have to be and sooo easy! Count me in! Happy weekend beautiful babe!!!! Almost tooooo easy! ;-) Thanks, Andrea! Carlee, I'm sure I've said it before but I have to say it again: you're brilliant! The only way to improve on a macaroon is by adding some caramel-y flavor. And pecans! LOVE IT! hehe! I'm not sure I'd go that far, but I'll take it anyway! Thanks, Kelsie! These look sooo good. I'm adding the chocolate to mine! Thank you for sharing. I highly encourage the chocolate too! Thanks! These are the easiest Macaroons I have heard till date :D! And it has my favorite Dulce-de-leche as one of the ingrdients!! It's hard to go wrong with that list of ingredients, huh?! Ha! 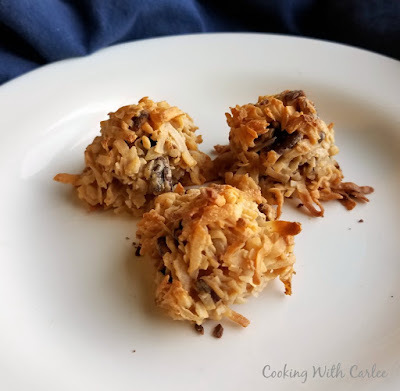 It's hard to beat three ingredients and almost no effort!